When its not in some sort of mode where it is touchable? This entry was posted in Android on 10/13/2011 by MantasCode. Thank you, simple and useful tip! However, the arguments seems to be pretty redundant…. I tried this and it works at the most cases, the only strange case that I could not figure out yet why it happens, is when you rotate the device then I call a performClick to say Position cero, the onClickListener is called and the DetailView for the positioned cero is called, BUT if the last activated item was positioned 3, positioned 3 still continues highlighted. So you send just the row you need and not the whole listview. send the correct position in the performItemClick command? 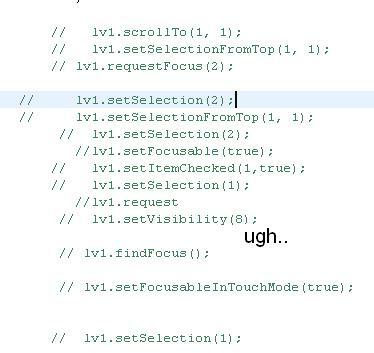 I would also like to handle touches in an empty space on the list.